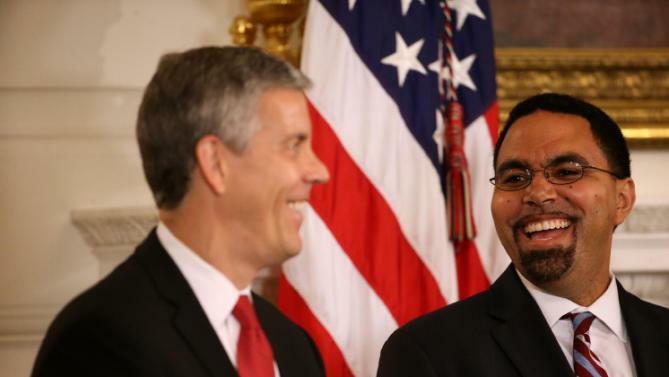 Arne Duncan is out. John King is in. It’s the kind of tone deaf decision we’ve come to expect from President Barack Obama on education matters. We’ve put up with 7 years of Duncan’s buffoonery as U.S. Secretary of Education: A man with no practical knowledge of the field. A corporate functionary. A drone. A mouthpiece for all the worst ideas of the 1% to sabotage public schools and replace them with charters. And who does Obama replace him with!? Former New York State Chancellor King!? A man who was almost run out of his state on a rail!? A man with – admittedly – more experience than Duncan but all of the worst kind. King resigned his NY position in the throes of terrible publicity for his and NY Board of Regents’ foolish approval of an obviously fraudulent charter school run by an obviously fraudulent con man. 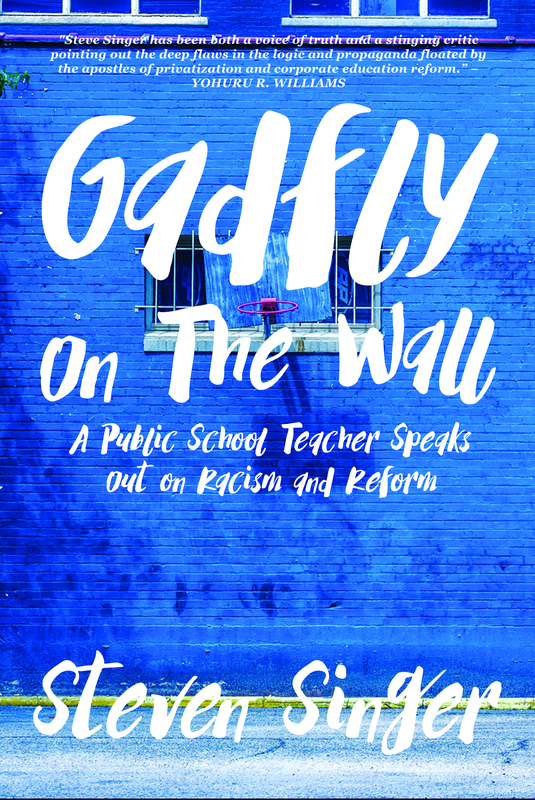 He ignored and dismissed parents at education forums, refused to fix an education system that he, himself, destroyed and was met with the largest opt out movement in the country. Oh. And that education experience I spoke of – he spent three years teaching in a “no excuses” charter school with a high suspension rate. And now King’s the top policymaker in the nation for public schools. It’s hard to imagine a worse choice. The Koch Brothers? Donald Trump? An inanimate carbon rod!? Lest we forget, this is a decision made by Democrats – the supposed saviors of education. Progressives have been howling against Obama’s test-and-punish education policies since early in his first term. And now when this liberal lion has an opportunity to show what he’s learned, to demonstrate that he’s taking our concerns seriously, his response is a middle finger salute. The Presidential Primaries are only a handful of months away. If the Democrats really wanted to court educators, the party would have put pressure on Obama to make a pick teachers might actually be able to stomach. After all, whoever the President picks will only have a year in office – not long enough to make any major changes one way or another. But at least the Democrats could make a show of listening to an important voting block. Instead the Democrats have demonstrated their true colors. They don’t care about schools, teachers, parents or students. They figure we have no where else to turn. We’re a gimme. They don’t have to concede anything. We’ll vote for whoever the Democratic nominee is. I am only one man. I belong to a lot of education groups, but I am speaking only for myself here when I say this: MY VOTE IS NOT A SURE THING. I will not vote for just any Democrat over any Republican. No, I don’t see any of the GOP candidates as being good for education. But most of the Democrats are the same or almost the same. If the Democrats don’t give me a candidate I can believe in, I will not vote Democrat. I will vote third party. Heck! I’ll write in “John Dewey” before I’ll vote for a faux progressive Democrat like Obama. I know what some people will say. This is a wasted vote. We have to keep a seat at the table. We need someone who maybe someday might possibly do something just a little bit helpful. And that’s exactly why we’re in the predicament we are now. We can’t keep voting for the lesser of two evils, because at the end of the day, we’re still voting for evil. I am so sick of politicians who smile to my face and stab me in the back. If I’m going to vote, it will be for someone I believe in, and if a Republican bent on destroying public education wins, at least he’ll have the decency to be honest about it. I really do like her, Alison. She is excellent on education issues, and actually seems willing to prove herself. She’s a real possibility. So is Bernie Sanders regardless of his Dem ties. Bernie talks the talk and might walk the walk if he could get past the Demo Party corporate toadies. Doubt that he can, and he has said he won’t run third party. I voted Jill Stein the last go round,very satisfying although a safe California vote. I hate the lesser of two evils scenario that we are seemingly eternally stuck with, but can’t even imagine voting Repub, so what’s a mother to do but vote one’s conscience. The oligarchs run the country anyway. See Chris Hedges for the likely end game. I wish public education, without the “Common Core”, standardized universal accountability testing insanity could be a unifying political effort. Unfortunately we’ll have to wait and see. Thanks for listening. I am 100% with you on this Steve. I will not vote for a Dem just because….and certainly not for Hillary. Maybe Jill Stein…and if Jon Huntsman was running, probably would vote Rep for the first time in my long life. i am backing sanders because of his positions on other issues. I have been reluctant to become a single issue voter but you may be right: John Dewy for President has a nice ring. He may get my vote in November! Get out to the primary and vote for Sanders, please. Clinton is the same type of corporate shill as two-faced Obama. The primary voting is key; otherwise, it’s Clinton. In the 1980’s, Democrats and labor leaders (Albert Shankara) bought into the false narrative that public schools were failing. This failing meme was fed by unsupported assertion, misleading international testing data and miserable graduation rates in too many communities. Almost none of the failing public education assertions were subjected to a professional peer review. If they had been, it would have quickly come to light that it was failing communities in abject poverty that made the schools look bad and often those schools were the only functional institution left in these failing communities. So, Bill Clinton led the charge for the AFT’s charter school ideas and for what has become standardized test and punish education policies. Maybe not taking responsibility for grinding poverty in America made blaming everything on teachers and public education seductive, but it is destroying the foundation of American Democracy. So much so that in order to institute their hair brain education schemes, a political party name Democrats has actively fought to eliminate local school control through democratic process with their strong mayor schemes and federal control supervised by non-educators like Arne Duncan. Both the Democrats and the Republicans have lost their way. Democrats used to be for democracy and republicans used fight for local control. Now they are both working for corporate run for profit privatized education that eliminates the voice of parents in their children’s education.